I didn’t support Boldt, but I also didn’t blog against him, staying out of campaigns to let the hotheads currently ruling over the Clark County Republicans to succeed or fall flat on their own. They failed miserably in my opinion. But Marc Boldt did win with support from a breakaway segment of the CCGOP and Democrats as well, a segment of that party endorsing him over Democrat candidate, Battle Ground City Council Member Mike Dalesandro. And as one would expect, Marc is very pleased as indicated in an email received this morning from Marc, WE did it! I am disturbed by the sentence because some of the divisions now existing within the county came about because Marc chose for quite some time to ignore and turn a deaf ear towards constituents as he repeatedly sided with former Commissioner Steve Stuart in pushing ahead on the CRC light rail project voters indicated we did not want by defeating every last single funding measure put before us, he joined in with Stuart in promising us a vote on the light rail project itself, but opposed actually giving us that vote. He initially joined in with Stuart to push for taxpayers to be on the hook for a baseball stadium that many indicated was not wanted, only switching at the last minute facing sanctions from the GOP as well as seeing the Vancouver City Council was not supportive of the notion. There was more, but I think you get the drift. So 2012 saw Boldt ousted and David Madore elected. Madore has shown himself to be quite naïve politically and set about pushing for changes he felt was needed, but trying to do everything at once as well as facing stiff opposition from what we refer to as the “Downtown Mafia,” primarily the editor of Lazy C, ‘Lefty’ Lou Brancaccio. As was done to Madore, many citizens will automatically see every effort by Boldt to undo anything Madore promoted as vengeance oriented, whether they should be repealed or not. The Lazy C will no doubt laud Boldt with much praise, until he does something contrary to the wishes and desires of the ‘Downtown Mafia,’ then you can expect ol Lefty’s poison pen to light up the pages of the paper. Most surprising will be those Boldt supporters that open their eyes and realize this chair position is nowhere near as powerful of a position as they expect. Sorry Boldt supporters, but he is still only one vote out of a five member council. I’ll also remind Boldt that he has chosen to step into a hornets’ nest of sorts. You see, since this was a three way race with the Write-in Liz Pike effort, some 60% of the county voters that voted did not vote for you and they are as divided as any time before. When you try to undo what Madore has accomplished because the Lazy C demands it, you will no doubt piss off many Madore supporters. When you don’t try to undo his proposals, you will piss off many from C3G2 along with the Downtown Mafia. You have a real tough row to hoe if you think you can easily solve the divisions so many citizens apparently do not want to see resolved. 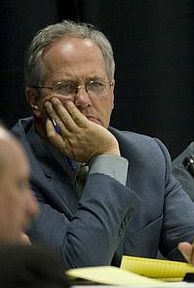 You are already off on the wrong foot by indicating that the county is somehow diseased or injured and in need of your healing powers, since many also support Madore. Fortunately we have Jeanne E. Stewart and now Julie Olson sitting on the council and I expect both ladies will do what they can to inject some common sense and decorum on the council. And if you decide to run roughshod over them, Marc, this blog will be on you like white on rice. Sadly, it appears I was dead wrong on the two ladies I supported over the years as the very first meeting of the new county council has shown they are more interested in following lock-step with Marc Boldt, who has shown he is out for revenge more than anything else. Frankly, I wonder if you have the ability to “calm the waters” of the county that you claim you possess. You won; you did it, now it rests squarely on you to show you can do what you didn’t do before. If Boldt’s efforts at healing means that he will actually listen to his constituents and consider the wishes of the majority, then he may be able to “heal” the rifts that he was quite responsible in opening up in the first place. If Boldt’s efforts at “healing” means that he will attempt to use his position as chair to manipulate the agenda and block undesirable (in his view) votes (by manipulating the meeting agenda) that have indications that the majority on the board (4 nominal Republicans) would pass against his opposition, then there will be no healing and he can expect to be tossed out in the next election for this county-wide position. I understand, however, that the term he managed to win will allow him to retire with “full benefits” from the state pension plan for legislators and other officeholders–something that he apparently was not previously able to do from a lack of sufficient time in public offices. Perhaps he will be less controversial, now, in an effort to avoid an unpleasant voter revolt. Let us not hold our breath. This was Marc’s idea of “healing” a couple of days ago. I thought I’d share with everyone my brother-in-law’s “gracious” remarks, via text message (He lacks the courage to talk to me directly) concerning his election victory. I did not start this conversation, to set the table. In fact, save for a single instance, Boldt has started every text message session with me since he began to pester me back in…. oh…. March, was it? This is all on Marc, word for word, letter for letter. Kinda like when you ripped off 5 grand from your campaign account in 2012, repaying a loan you never gave yourself. Where’s the snappy comeback, bro? Like I said, you stole $5000 Good job. What. The. Heck. HAPPENED to you? You used to be a good man who’d walk through fire before you’d lie… who’d listen to anyone, any time and give them a fair hearing… and who actually represented the people. Now… you’re just another political thug. You fooled everyone… but you didn’t fool me. And I ashamed of you. stop communicating with me in any way. I don’t even want to know whatever the hell it is you’ve become. Are you capable of understanding the phrase “do not text me?” How would your bright, shiny new lie of a job look wrapped around a restraining order? Keep it up. Well, we’re going to have plenty of time to discover the thickness of your hide. I repeat, do not fricking contact me again. Now, I’m sure that Boldt supporters will applaud this passive aggressive nonsense. Just remember, the next time you disagree with any of his tax or fee increases, or his resurrection of the CRC Scam that he fought so long and hard to ram down our throats… or his efforts to infringe on our 2nd Amendment rights, this is what he’s thinking about your concerns… which will mean less to him now then they did back when he was a commissioner… and they meant nothing at all to him back then. Ultimately, I blocked him through Verizon, once I figured out how. And how sad is that, that Boldt starts the “healing process” by jamming a stick in my eye. Probably only a matter of time before leftists take a page from history and boorishly refer to the new county council as four nuts and a Boldt. One might note how many leftists came out of the woodwork, telling the world how much respect they used to have for Liz Pike, but that’s all changed now. Okay. Yeah. Right. Got it. And the I-5 Bridge is going to collapse any moment now. Businesses won’t be able to get out of the county fast enough without CRC lite rail. Lawsuits will fly over Madore with imminent county bankruptcy. Ya gotta just love how freely Democrats like to give advice to Republicans. Well, as far as I’m concerned, if Liz Pike seeks reelection in the 18th, she’ll have nothing to worry about. After all, not everyone is a Socialist, as Ms. 41% and Mr. 37% found out. That is; if they’re able yet, to see past their noses that got punched in. Marc Boldt can gloat about his victory as he wishes … but I do believe that he ought to keep in mind that 3 out of every 5 votes went to another candidate. That is hardly a “mandate” and suggests that he might easily be beaten at the next election.